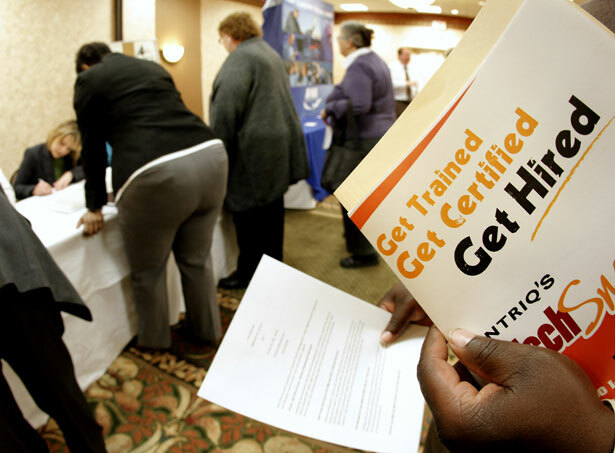 Unemployment dropped to 8.6 percent, while the economy added 120,000 new jobs. Is this good enough news? Today the Bureau of Labor Statistics announced that unemployment dropped to 8.6 percent from 9 percent, while the economy added 120,000 new jobs. Is this actually good news? About half of this decline is due to workers giving up looking. We can get a better sense from the employment-to-population ratio, because unemployment doesn’t track people who have stopped looking for work. The employment-to-population ratio did increase slightly to 58.5 percent, but this is still within the range it has been for two years. In fact, over the past year, employment-to-population has stayed consistently depressed. Every indicator we look at—job openings, the rate at which people quit their jobs for new opportunities, the number of hours worked in the economy—has stayed weak during 2011. With job growth failing to exceed population growth each month, and with no serious increase in the percent of Americans working, 2011 was a lost year for the economy. Lost years for the economy have major consequences. Beyond the human misery that results, they put the entire project of liberal governance at risk. Choices made early by this administration resulted in no advancement on three fronts that could bolster the struggling economy: fiscal policy (increasing the deficit through spending on investment and temporary tax cuts), monetary policy (increasing the money supply to stimulate growth), and dealing with the problems in the housing market. This was a victory for the network of elites that The Nation’s Ari Berman refers to as the “austerity class.” By buying into the now-conventional wisdom that it was economically unsound to grow short-term deficits without simultaneously decreasing long-term deficits, long-term deficit reduction was turned into a co-equal problem of economic woes. This is like a doctor telling a patient suffering from multiple gunshot wounds that he should have a healthier diet—it might be true, but there’s a much more pressing problem. Want an example? In the 2010 State of the Union address, President Obama stated that he would freeze 2011 discretionary spending even though unemployment was projected to be above 8 percent, because, he said, if “we don’t take meaningful steps to rein in our debt, it could damage our markets, increase the cost of borrowing, and jeopardize our recovery,” which “would have an even worse effect on our job growth and family incomes.” This conventional wisdom gave the Republicans the leverage they needed to destroy any pro-active economic agenda. So the administration spent much of 2011 engaging in the wrong analysis of the economy, one that looked like that of the far right. Early in the year the administration brought in new advisers, notably Bill Daley as chief of staff, in order to repair relationships with business in the wake of financial reform. This incorrectly diagnosed the problem as a liberal government beating up on unappreciated job creators, instead of weak income and mass unemployment among workers. In his 2011 State of the Union address, Obama argued that we needed to “win the future” by investing in education and bringing “discretionary spending to the lowest share of our economy since Dwight Eisenhower was president.” Recent college graduates are suffering from high unemployment and there’s no real reason to worry about government debt levels, but you wouldn’t understand that from that speech. During the debt ceiling showdown this past summer, when the administration was trying to drum up support for long-term deficit reduction, economic advisors like Gene Sperling argued that new confidence in deficit reduction itself would help the economy, ignoring the fact that the markets, with negative real interest rates, were screaming for the government to run a bigger deficit. Meanwhile, President Obama made references to “structural” issues in the labor market, as if the pain of unemployment wasn’t shared broadly across all occupations, industries and types of workers. Thus the Democrats spent 2011—which could have been a crucial year for the recovery—in a futile debate with the Republicans over the budget. From the original government shutdown in April to the debt ceiling fights in July, Republicans showed that they were capable of making even the most trivial changes to the budget costly to the Democrats. As time went on the administration became ever more willing to make huge concessions to get a deal and restart the economy, and each time was left at the table. When a ratings agency downgraded federal government debt, it wasn’t because of the long-term deficit but instead over this political gridlock. If these two goals, short-term deficit spending and long-term deficit reduction, had been separated early, with maximal energy put towards job creation until unemployment was much lower, then the economy would be in a much healthier place. The GOP would have had less disruptive leverage and threats like using the Constitution to avoid the debt ceiling fight would have been more credible. The administration pivoted back to jobs in the fall after the disaster of the debt ceiling fight. Time will tell if it was too late, and if they are willing to fight hard to bring unemployment down. Monetary policy is another avenue that spent 2011 in limbo. Federal Reserve Chairman Ben Bernanke has signaled that he won’t let the economy get worse, but he’s skittish about taking the potential risks that would be required to push the economy to full employment more quickly, regardless of how bad the situation is now. The Federal Reserve is generally hesitant to print more money because of fears of inflation, even though injecting money into the economy would likely stimulate jobs—is it willing to tolerate temporary higher inflation in order to bring unemployment down? If it did, this month’s jobs report, and last month’s, might have looked a little better. In the midst of collapsing prices, President Franklin Roosevelt in a fireside chat in 1933 announced that “it is the Government’s policy to restore the price level first”—a signal to the markets that the New Deal was going to take monetary policy very seriously. President Obama has shown less interest in monetary policy, reappointing the moderate Republican Ben Bernanke to office and leaving seats open for years. Leaving vacant seats across the judiciary and in key regulatory agencies such as the Consumer Financial Protection Bureau, Obama’s lack of movement on recess appointments has left the Fed tilted to the right. Since the other people that sit on the Federal Reserve are hardline conservatives appointed by banks, getting people concerned about unemployment there is even more important. At the end of 2011, key liberals like Christina Romer and Paul Krugman started talking about a new way of doing Federal Reserve policy based on “nominal GDP targeting,” which would allow for higher inflation in weak economic times. Meanwhile, Chicago Federal Reserve President Charles Evans put out a plan to allow 3 percent inflation while unemployment is above 7 percent. These are good ideas; the administration could put them into practice by filling vacancies with appointees who understand their value. The third important element of the recovery is restoring the housing sector. The burst of the housing bubble has left a quarter of all mortgages underwater and millions of foreclosures hitting every part of the country. Foreclosures are a lose-lose-lose, devastating homeowners and neighborhoods, ravaging municipality budgets and hitting the creditors themselves. Empirical evidence shows a link between foreclosures and decreased economic activity in this recession. The most obvious way to deal with this is to allow courts to write down mortgage debt in bankruptcy, but the Obama administration passed on requiring bankruptcy modification, or “cramdown,” as part of the bailout. Ever since then, abuses in the mortgage payment “servicing” system—ranging from robo-signing to phantom foreclosure referrals to illegal foreclosures on servicemen overseas—have been reported by both community activists and financial analysts. In late 2010, the largest banks voluntarily halted foreclosures to investigate before going back to business as normal. The administration could have pushed hard on investigating the foreclosure market. Instead they pushed for quick settlement with the largest banks engineered by several attorneys general, putting pressure on attorneys general like Eric Schneiderman who want to investigate further. A full investigation would have given the administration more leverage in pushing banks to stem the foreclosure crisis. Jonathan Chait is only the most recent pundit to wonder why liberals are so upset about the administration and the state of the economy. But the answer is obvious. Everything progressives have fought for—from the policy advancements of the Obama administration like healthcare and financial reform to the New Deal and Great Society programs that remain, like Social Security and Medicare—has been at risk as a result of this Great Recession. A longer period of sustained joblessness will wreck the working class and devastate the budget, leaving our economy even weaker. Important advancements that will actually win the future—from pricing carbon to emptying out our prisons—are virtually impossible with the country experiencing so high a level of unemployment. There are ways forward; it is just a question of whether the administration is prepared to take them. It is easy to lose precious time, and we’ve just lost a full year with nothing to show for it.